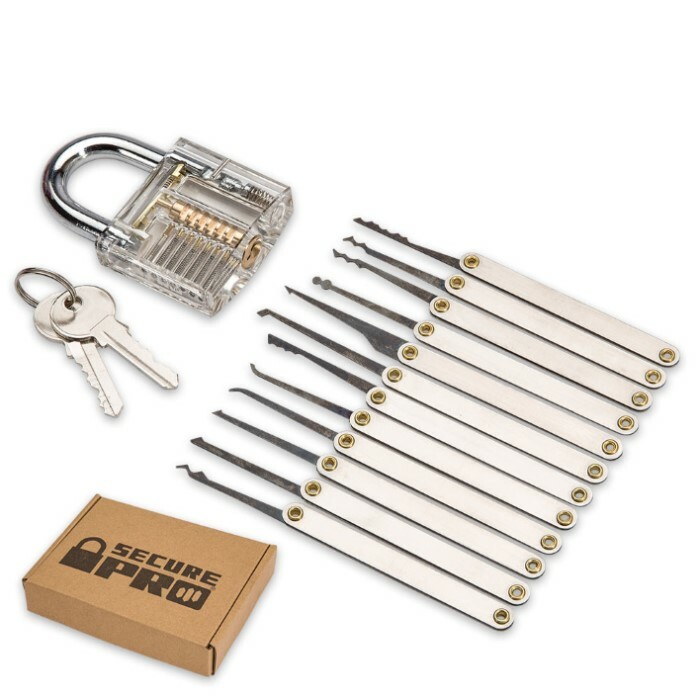 Secure Pro Practice Padlock and 15-Piece Lock Pick Set | BUDK.com - Knives & Swords At The Lowest Prices! 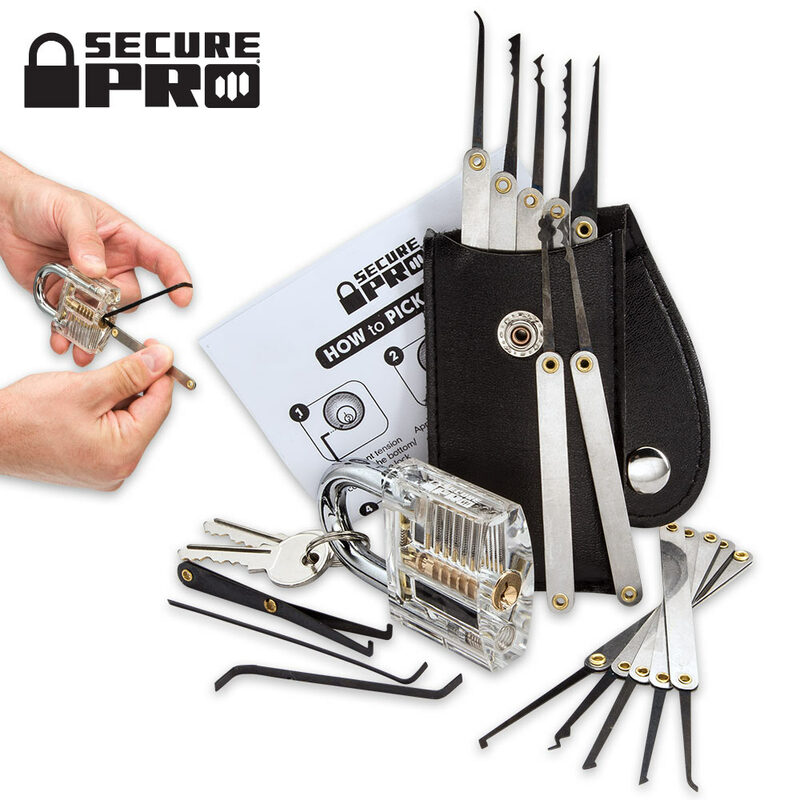 Whether a beginning lock picker or a veteran locksmith, everyone needs practice, and Secure Pro’s Practice Padlock and 15-Piece Lock Pick Set is a great way to learn and hone your skills. 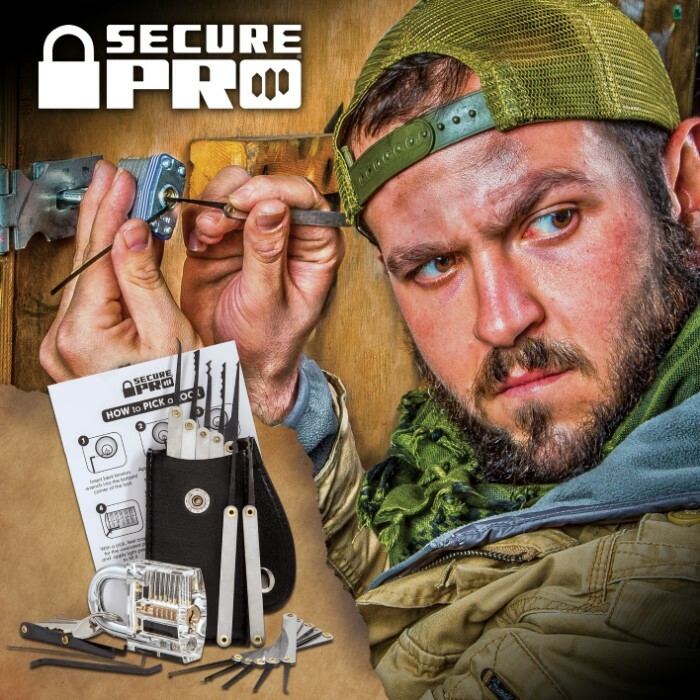 With its transparent shell, the easy-to-use practice lock allows you to see the inner workings of a standard pin lock and, thus, develop a greater understanding of its operation. Combined with the wide assortment of picks in the 15-Piece Pick Set, the kit also affords a chance at trial-and-error with no problematic consequences, before you attempt to tackle the genuine article. Fear not! Everyone gets stumped, and if you find yourself hopelessly "locked out" of your practice padlock, this handy set includes two master keys, as well as simple, straightforward lock picking instructions. Also includes a handsome black faux leather snap pouch for storing picks. Gave them as gifts at Christmas and everyone is super excited and happy with their gifts. Much nice. Very good. Husband pleased. I couldn’t seem to find a legitimate practice lock pick set for beginners anywhere on the internet but finally came across this site. Seemed genuine and had many good reviews. Very happy I pulled the trigger. My package came MUCH earlier than expected. Everything is of high quality, and I managed to pick the practice lock (my first lock picking attempt ever) in around 15-20 minutes. The tools/picks won’t need much sanding, if any (in my personal opinion). Very fun and great practice. I highly recommend this set to any beginners looking for a legitimate lock pick set from a genuine source. I forgot to review this, but I bought it a while back and it was exactly as described. Great quality and great value. A good practice set. Only thing I would do is take some 200 plus sandpaper and remove the black coating on the tools. The texture is a little rough and the tools work better when smooth. and the practice loke is a good addition to the set as well. I found it a little cheaper on another site after I had ordered but I am not complaining It is a nice set for beginners. I am a noob to lockpicking, but the clear plastic lock and the well designed picks had me opening the clear lock in minutes, and my front door in about an hour! My wife bought this for me as a birthday gift. I started out with a very small, 5 pick set. This one comes with 12 picks and 3 tension wrenches which is awesome. I've been fairly rough with a few of them and they have held up nicely. The clear practice lock is cool as well, especially for beginners, like myself. I definitely recommend this item. Might get a set for my friend, in fact.